Rotherham United twice went ahead this afternoon at Glanford Park in the first leg of the League One Play-Off but were twice pegged back making it even-stevens going into the second leg. The Millers started well getting a corner in the opening minute which went wide followed by some good work between Joe Mattock and Ryan Williams whose pass into the box to Michael Smith was blocked by an Iron defender. At the other end Williams did well to get to the ball before Jordan Clarke and put it behind for a corner which Richie Towell blocked. On eight minutes the hosts got a free-kick which was taken quickly which Richard Wood and Michael Ihiekwe had to deal with. Minutes later Josh Emmanuel did well to keep Duane Holmes at bay before good work again between Mattock and Williams saw the Australian get a lovely ball into Smith but his knockdown couldn’t find a black and yellow shirt. On seventeen minutes Taylor latched onto a good ball from Towell and the Millers number eleven put the ball into the net to give the Millers the lead sending the one thousand six hundred travelling fans mad. But their jubilation was short lived when less than a minute later Hakeem Adelakun put the ball into the path of Holmes who saw Marek Rodak out of his goal and clipped the ball over him and coming off Ihiekwe who was trying to get back onto the line going into the net to make it one-all. 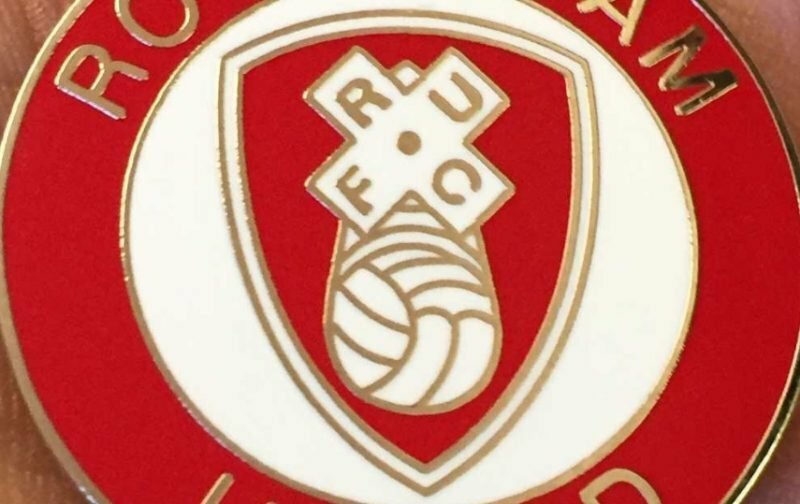 Rotherham looked a bit nervous after that and Scunthorpe found their stride with Ihiekwe putting a cross from Ivan Toney behind with the Iron rattling the crossbar from the resulting corner. A mistake by Rory McArdle almost let the Millers in before Taylor’s cross into the box was cleared by a defender followed by a shot by Will Vaulks from distance which was no trouble for Matt Gilks in the hosts goal. If Towell had looked up a minute later he would have seen Taylor in plenty of space but the Brighton loanee opted to shoot and it went into the Iron fans behind the goal. An awful scything challenge on Williams by Murray Wallace saw him get the first yellow of the afternoon with Millers’ skipper Richard Wood getting the second for a foul on Toney. In the opening minutes of the second half Matty Palmer saw yellow for what referee Tim Robinson said was deliberate handball although it looked like the Millers midfielder couldn’t get out of the way. Marek Rodak did well to collect from a Rory McArdle header before Joe Mattock got in the way of a shot from Funso Ojo. Ryan Williams swerved past his marker to get into the box but was tripped with Jon Taylor’s resulting free-kick going straight into the waiting arms of Matt Gilks. Gilks punt down field found Duane Holmes who had his feet taken from under him by Taylor who saw yellow for his trouble. Former Millers loanee Josh Morris took the kick which had to be cleared firstly by Richard Wood then by Michael Ihiekwe before Emmanuel finally got it away from danger. Iron ‘keeper Matt Gilks hobbled off just after the hour mark and was replaced by Rory Watson followed by Joe Newell coming on for Jon Taylor for the visitors. And the both time either sub was involved was was after Emmanuel did well to shrug off the attention from Morris before his cross found Richie Towell in the box who tried an acrobatic shot which kindly fell to the waiting Newell who volleyed the ball into the far corner to put the Millers back in front. At the other end two good saves from Rodak from Holmes then Toney kept the Millers in front before Towell was replaced by Semi Ajayi. Michael Smith, who had had his shirt Constantinople pulled all game – again, saw a shot blocked before the Iron’s Cameron McGeehan replaced Hakeeb Adelakun. Holmes got to a loose ball first and sent Morris on his way but he couldn’t get past Ihiekwe followed by some nice work from Smith who held the ball up for Newell but the Millers winger didn’t let the ball settle before he tried a shot which went wide. Ryan Williams almost furthered the visitors lead but he saw his shot across goal go just wide. With it looking like the Millers would take a lead into the second leg Scunthorpe equalised after a silly free-kick eventually went for a throw to the home side which was flicked on from Toney finding Cameron McGeehan who bundled the ball over the line to make it two-two. In seven minutes of time added on Williams was replaced by Anthony Forde. Smith had to become a defender and clear a Morris corner away before Murray Wallace dragged a shot wide. A pretty even game so a draw was probably the best result in this dinner-time kick-off making Wednesday night an interesting affair.